Q: How safe is it to ride in a wheelchair in automobiles? A: Wheelchair safety researchers say that riding in a wheelchair designed primarily for mobility is more dangerous than being in a car seat because most wheelchairs and scooters on the market aren't made to withstand the forces in an auto accident. Q: So what's the best way to ride? A: Researchers recommend moving the person from the wheelchair to a seat inside a bus or van. If that's not possible, crash-tested restraints should be used for both wheelchair and rider. They also say it's best to buy wheelchairs that meet voluntary industry standards for safety. Details can be found at http://www.rercwts.org. Q: Why don't most buses have seat belts? A: Bus companies say their high-back seats are safe and designed to protect passengers. Mandatory seat belt laws in most states apply only to passenger cars or people in the front seat, but there are six states that do require belts on school buses. Q: What do regulators say? A: The National Transportation Safety Board began recommending belts and other safety features on long-distance buses decades ago. It said a lack of seat belts was a factor in the deaths of five members of Ohio's Bluffton University baseball team, whose bus plunged from an Atlanta highway overpass in 2007. That led the father of one of the players killed to lobby Congress to require changes designed to prevent passengers from being thrown out windows and strengthen bus roofs. Q: Why weren't changes made? A: The National Highway Traffic Safety Administration resisted calls for seat belts on buses for years, siding with bus industry leaders. They didn't move on the proposals until the Obama administration ordered a safety review after two crashes killed passengers who were thrown from buses. Q: Does that mean changes are coming? 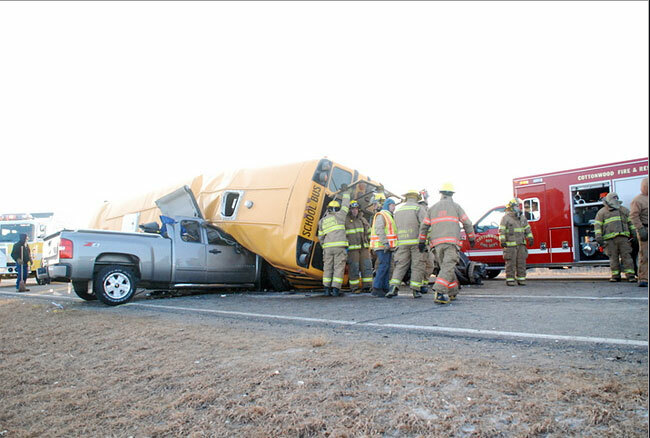 A: Several deadly bus wrecks in the past three years were enough to lead Transportation Secretary Ray LaHood to announce in November that the NHTSA later this year will propose requirements for seat belts on long-distance motor coaches. Very well explained and nothing more nothing less. So what will be the safe ride for wheelchairs? So sad to see the picture. People with disabilities use vehicles.The one who ride the wheelchair and the one who accompanied must educate yourself on the safe way to properly restrain both the wheelchair and the wheelchair occupant.for its really hard having disabilities. Wheel chairs are definitely not safe for ride. This accident is really dangerous. Handicapped people should use Wheelchair occupant restraint systems for journey purpose.